The Surrey Police Band have raised £1,000 in aid of the UK Police Memorial, the charity of the year of Chief Constable Nick Ephgrave. Chris Webb from the UK Police Memorial receiving a cheque from Surrey Police Band Musical Director Graham Atterbury. The band have played a number of concerts over the last 12 months collecting donations from the audience for the Trust. A cheque for £1,000 was presented to the Trust at a Last Night of the Proms concert attended by hundreds of the band’s supporters and residents of Surrey. 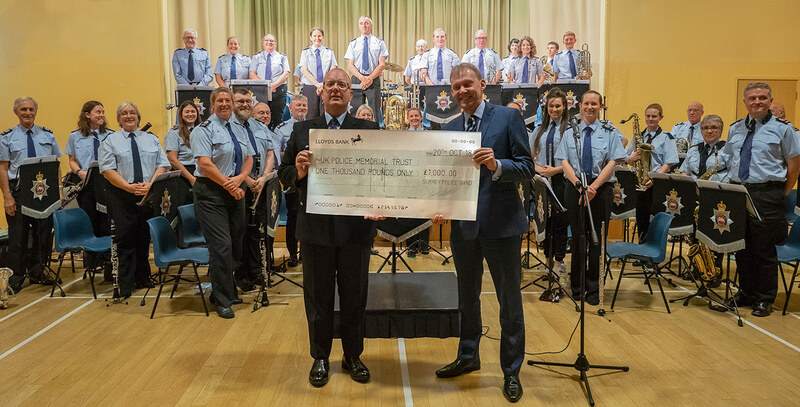 Surrey Police Band Musical Director, Graham Atterbury said: “Supporting the UK Police Memorial has meant a lot to the band and we were particularly honoured to be able to present a cheque to the Trust at our recent sell out Proms concert of the money raised. Chris Webb representing the Trust thanked the band and their supporters for their generous donations. He said: “that this was a clear example of the community putting something back to honour and commemorate those from our Police service who have given their lives to keep us safe and protect us from harm”. Surrey Police Band is made up of volunteers and plays concerts across the country to raise money for worthwhile causes.